An ultrashort pulse laser is a laser that fires regular beams lasting less than 10 picoseconds – or 10 trillionths of a second. This tiny pulse duration is short enough that it can excite electrons on the surface of a metal and modify its properties before the energy is converted to heat as the electrons 'relax," or return to a stable state, between each pulse. "So what happens is you have a lot of very excited electrons that travel around the place, and then they all relax, and that's converted to heat in one hit," said Dr. Adrian Lutey, a mechanical engineer and research fellow at the University of Parma in Italy who works on a project called TresClean. "And you can provoke some very interesting modifications in this way." The team is exploring how metal surfaces could be made resistant to water using lasers, including one of the world's most powerful ultrashort pulse lasers at the University of Stuttgart in Germany, with an average power of one kilowatt. 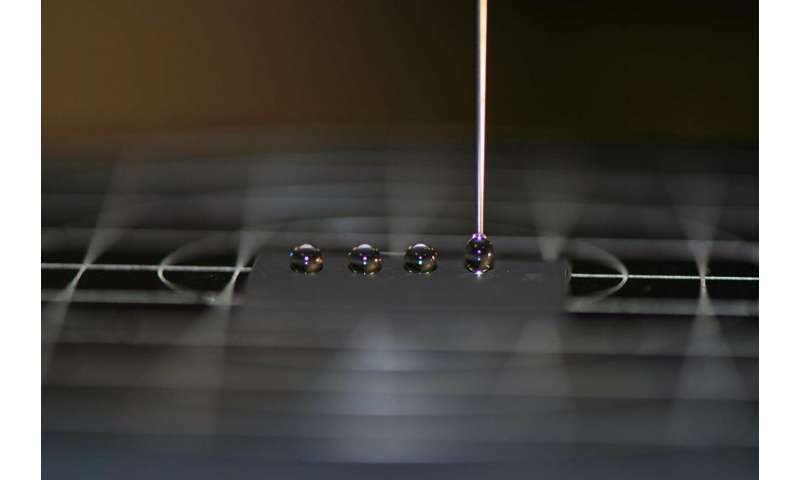 The lasers create tiny nanogrooves on the surface of the metal, and by trapping air bubbles, this stops water adhering to the surface. This rough surface has a similar effect to a lotus leaf, which has a surface chemistry that prevents water from sticking. Using this technique, it's possible to create liquid-repellent anti-bacterial surfaces. Bacteria thrive in water, so pipes and other equipment must be cleaned regularly to prevent any sort of build-up – a process that takes both considerable time and money. But if the surface never grew bacteria in the first place, this issue could be eradicated. "An analog is a bed of nails, the bacterial cells don't haven't anywhere they can attach to," said Dr. Lutey. "Using laser texturing to produce an anti-bacterial response is cutting-edge." "If we can reduce the amount of cleaning required, we can reduce downtime and we can reduce any risk of contamination where cleaning products end up in the food," said Dr. Lutey. Laser techniques could be applied elsewhere. For example, boats have a common problem dealing with a biofilm 'slime' on their hulls where bacteria have grown. But if the hull of the boat could be made resistant to water, then the bacteria wouldn't have anywhere to grab hold. "The idea behind this project is to develop prototypes that can get different properties in metallic surfaces," said project coordinator Dr. Ainara Rodriguez from the Ceit-IK4 research centre in Spain. "What we do is irradiate (heat up) the structure of the material with ultrafast laser pulses, which can increase the adhesion of the material, its hydrophobicity (the ability to repel water), or the colour of the metal itself," said Dr. Rodriguez.